There is no question of how important clear communication is in our day-to-day lives to maintain healthy relationships with our spouses, friends, and family. But It is just as important in the workplace. When an organization prioritizes teaching their employees to communicate effectively, the entire team begins to move forward, grow, and build strong leaders. In this infographic from CXservice360.com, I’ll share 10 tips to help make it easier, but first, let's take a deeper look at their points. Communication is truly effective when it delivers a message in a way that allows the listener to feel valued and heard. In other words, it makes listening and observing just as important as speaking. Have you heard anyone make these statements before? Have you made them? We tend to use statements similar when we don’t know how to fully express what we are feeling or do not feel as though we have the ability to communicate with leadership within an organization. At IMPACT, we have made a big push in 2019 toward effective communication both internally within the organization as well as externally with our clients. It’s a huge initiative and involves internal workshops, support from the entire team to hold each other accountable, as well as many learning lessons. Not only does it create a happier, healthier work environment but your bottom line also tends to improve. This all sounds great, however, if you are still struggling to find effective communication within your work environment the benefits above may only feel like a dream. The 10 tips below provide a great starting point to improving communication within your workplace. When we are working with clients or reporting on the financial health of an organization, we use data so why not use data to gauge the internal communication health of your organization? Examples of data that could be collected include how often your internal emails are being opened or the percentage of replies received from emails or company surveys. This data will help to determine the best way to communicate with your team. It is also important to share these findings. Let your teammates know the current open or submission rate of the communication and what your expectation of the rate should be. This helps to show that the response is being valued and used in decision-making processes rather than going to a general inbox never to be read. Be sure to present the results to the team you collected the information from. Not only will all those that submitted responses feel as though they will be listened to, future submission rates in increase as well. At IMPACT our team survey participation increase from 60% to 100% by simply following up and recapping the results. At IMPACT, video is key in our external communication with clients and sales process. However, not only are all of our client calls video-based but our internal meeting structure is as well. With half of our team remote, the use of video allows for a more well-rounded communication as it provides visual communication cues as well as builds trust within a team as well as with clients. Our favorite tools at IMPACT for video communication include Zoom for internal and external meetings and Vidyard GoVideo for a quick recap or explainer videos. The newly released GoVideo for mobile by Vidyard has also been beneficial for on-the-fly communication. A wiki is a website that allows collaborative editing by users and is becoming a valuable asset within organizations. For an organization, they can be thought of as what used to be known as a handbook or a reference guide of documentation. Maintaining a wiki internally improves process consistency across the organization and is often found as a valuable resource for onboarding new employees. This also allows for more transparency across an organization as employees may have access to meeting recordings and documentation to reference at any point. There are a number of different types of software to maintain a wiki within an organization from simply using Google drive to more robust platforms such as Confluence. (IMPACT’s current wiki platform). As an organization grows, the communication of big-picture visions and department updates to the group as a whole can become challenging. The use of a monthly newsletter provides a space to build upon company culture, recognize employees, provide insight into the vision of the organization, and follow up on the surveys used in #1. When thinking of communication, most often we try to analyze and improve upon the how and not nearly as much on the where. However the where is just as important. The design or layout of an office can have a large impact on how employees communicate. There has been an evolution in how offices are designed going from cubicles to open space or even a hybrid of the two. Over time, many organizations have found the need for collaborative spaces as well as individual workspace help to encourage teams to work together as well as provide space for deep focus and 1-on-1 meetings. IMPACT’s quick communication and messaging platform of choice is Slack, however, there are many alternatives available to organizations of all sizes. The use of an internal messaging platform is especially helpful in building employee morale and relationships for primarily remote organizations. At IMPACT some of our Slack channels include company updates, developer help desk, parenting life, random, happy thoughts (employee recognition), and specific client channels. One of the top complaints employees have about leadership is they are unavailable or have expectations that are unclear. In a top-down or one-way communication environment, these complaints are prevalent. By simply opening up lines of communication between leadership and employees, the complaints can be resolved. This may seem crazy to think that a single change can make such a huge impact and it kind of is, but it can make employees feel more willing to invest in the organization and makes employees feel more valued. For organizations that have a majority of their workforce on-the-move or in a non-traditional office setting, mobile applications can help promote communication and connection. In fact, many of the tools mentioned in this article have mobile versions or apps that allow for seamless communication in and out of the office. While the use of mobile apps may be very useful for some organizations, it is important to mention that these methods should be used sparingly as disconnecting when away from work is just as important as staying engaged in the workplace. As elementary as it may sound, creating a buddy system in the workplace is not only an effective method for onboarding new employee it is also an excellent way to share knowledge between employees in the same position or a step above. After implementing a buddy system, a collaborative environment is created from the start. The buddy system also allows the new hire to understand your company’s processes in a manageable way. Not only can the buddy system be implemented for new hires but it is also valuable as an ongoing program throughout the entirety for the of a individuals employment. 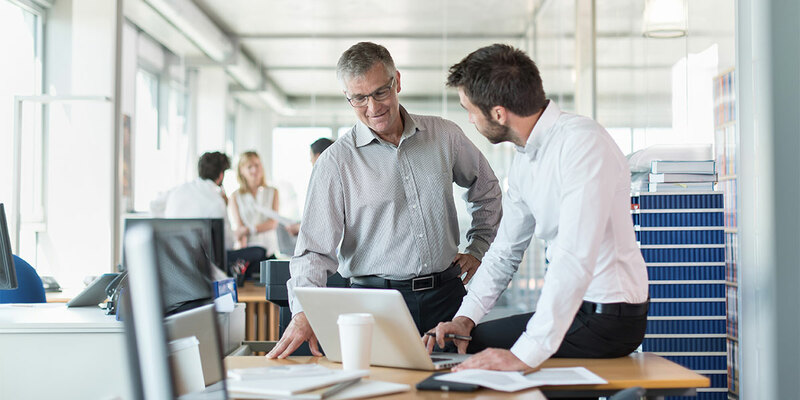 While the system may look a little different for long-term employees, the buddy approach can be fostered by working in smaller teams as well as through the encouragement of “coffee chats” amongst employees. The meetings allow for open communication to discuss what is working and what is not working as well as discovering solutions to common problems the team members may be experiencing. Lastly, an excellent way to encourage communication within the workplace is to create a culture of sharing information. By encouraging employees to share information and provide feedback, discussions can lead to innovation and personal development. Sharing information works well within the internal messaging network or within a Facebook group. At IMPACT, we use Slack to post breaking news articles as well as manage our IMPACTElite Facebook group. That wraps up the 10 tips to improve communication in the workforce! There is a lot of information, but starting with just one change can begin to take a positive turn for an organization as a whole. Hang on to the infographic below by CXservice360.com as a reminder!